Any die-hard football fanatic will have to put this gem on their "must-see" list. Visitors can customize their adventure at this ultimate interactive experience with their favorite college football team! RFID (Radio Frequency Identification) is ingrained in your ticket; when you enter the building, you'll be welcomed with huge screens displaying realistic images and sounds of your team. But, the most amazing treasure to be found is the wondrous, luminous Helmet Wall. 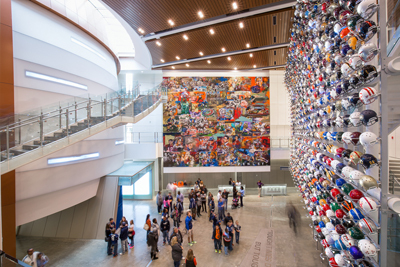 A three-story jaw-dropper, this wall is covered in helmets of college football teams. How do you know which helmet belongs to your favorite team? Well, with RFID, your team's helmet will light up so you can spot it right away. Atlanta's College Football Hall of Fame, which opened in 2014, is a futuristic take on traditional fandom that you'll have to see to believe. Founded in 1893, The Field Museum is one of Chicago's best museums, and a world-famous attraction that continues to thrive thanks to the support of the community. Most famous for Sue, the most complete and well-preserved T-Rex fossil ever unearthed, The Field Museum has many gems waiting to be discovered. One of the most exciting is the "Inside Ancient Egypt" exhibit. This wonderful exhibit holds one of the largest collections of mummies in the entire nation. A three-story mastaba contains two rooms of Unis-Ankh, the son of a Pharaoh. It's a 5,000 year old tomb! Along with the Book of the Dead, the mummified dead, and even a bronze sculpture of a cat goddess Bastet (believed to contain a mummified cat), there is an ancient Egyptian marketplace to explore. Jewelry, ceramics, and artifacts represent everyday Egyptian life, before they were wrapped up in death. Discover the ways of the Ancient Egyptians, and if you get scared, call your mummy. 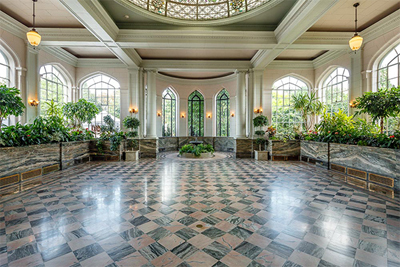 A 66-acre paradise featuring 19 pristine gardens is home to a wonderful collection of flowers and plants alike! The seasonal festivities and children's adventure gardens are entertainment enough, but an even greater treasure hunt awaits…the hidden topiary miracles scattered throughout the garden! Beautiful yellow and purple pansies make the tail of a giant green peacock. Poised and statuesque horses sculpted from foliage protect the garden with silent neighs. 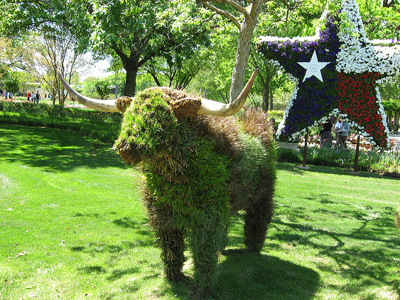 A topiary version of Ferdinand the Bull from the famous children's book "The Story of Ferdinand" brings a lovable character to life with the help of artistic gardening. Visit the Dallas Arboretum and Botanical Garden and prepare for your breath to be taken away. If you think of yourself as being 'cultured,' take a trip to the De Young Museum in San Francisco and discover both ancient and modern art of various cultures throughout the world. "Yua, Spirit of the Arctic: Eskimo and Inuit Art from the Collection of Thomas G. Fowler" is a treasure that cannot be overlooked and makes the de Young one of the best museums in San Francisco. In Eskimo/Inuit culture, it's a common belief that everything on Earth, from animals to inanimate objects, carries a soul that must be honored. This installation includes nearly 100 objects ranging from 300 B.C. to the contemporary era. Anything from charms, kayak models, dolls, and stone sculptures made with whalebone and ivory, are available to gawk at in the De Young Museum. Travel back in time and head to Toronto's famous historical attraction, Casa Loma, the only castle in North America, and a grand one at that. Sir Henry Mill Pellatt, a Canadian financer who at one time controlled 25% of Canada's economy, spent over a million dollars on this luxurious home. Explore 180,000 square feet worth of rooms filled with expensive furniture, a secret staircase, and an underground, only a few of the wonderful adventures waiting at Casa Loma. What's at the end of the tunnel? You'll have to find out for yourself. Don't get lost! The #1 Zoo for Kids in the United States is home to more than 1000 animals on 60 fun-filled acres! A cute and rare treasure to be seen is the Pigmy hippo. Native to West Africa, the pygmy hippo is the hippo's smaller cousin. Zuri, the baby girl, is one of 30 pygmy hippos in captivity in North America. It's estimated that there are only 3000 in the wild. Come see a rare gem sparkle with all her cuteness at Tampa's Lowry Park Zoo.